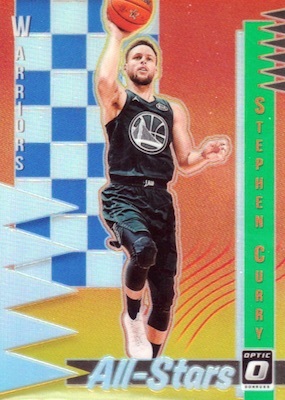 Merging various '18-19 Donruss NBA designs with a lineup of Prizm parallels, 2018-19 Donruss Optic Basketball includes Holo, Orange (#/199), Lime Green (#/149), Red (#/99), Pink Velocity (#/79), Blue (#/49), Black Velocity (#/39), Gold (#/10), Green (#/5), and Gold Vinyl (1/1) editions for the base cards and Rated Rookie subjects. 2018-19 PANINI DONRUSS OPTIC COLLIN SEXTON RATED ROOKIE AUTO PURPLE RETAIL SSP!! 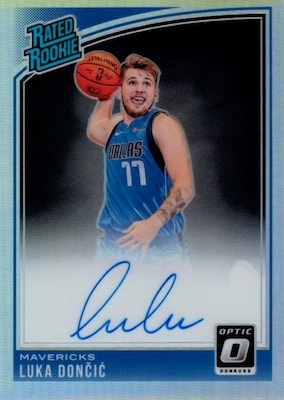 2018-19 Panini Donruss Optic Basketball- Luka Doncic RC on Card Auto (Blue) 49! 2018-19 Donruss Optic Signature Series Gold Auto 10 Magic Johnson Lakers Great! 200 cards, including 50 Rated Rookie cards. PARALLEL CARDS: Holo, Blue Velocity (Multi-Pack), Checkerboard*, Hyper Pink (Walmart Mega Box), Purple*, Shock (Target Mega Box), Orange #/199, Lime Green #/149, Red #/99, Pink Velocity #/79, Blue #/49, Black Velocity #/39, Pink #/25, Purple Stars FOTL #/13, Gold #/10, Green #/5, Black 1/1, Gold Vinyl 1/1. CHOICE PARALLELS: Dragon, Red #/88, Black Gold #/8, Nebula 1/1. 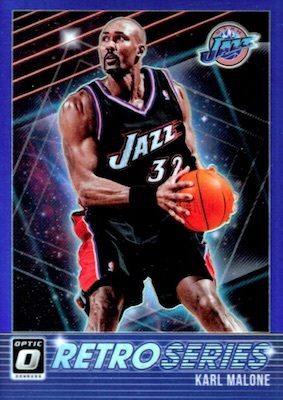 FAST BREAK PARALLELS: Holo, Purple #/95, Red #/85, Blue #/50, Pink #/20, Gold #/10, Black 1/1. PANINI REWARDS PRIZMS (Online): White Sparkle. PARALLEL CARDS: Holo, Purple, Blue #/49, Pink #/25, Gold #/10, Green #/5, Black 1/1, Checkerboard 1/1, Gold Vinyl 1/1. CHOICE PARALLELS: Base Choice, Black Gold #/8. PARALLEL CARDS: Pink #/20, Black 1/1. 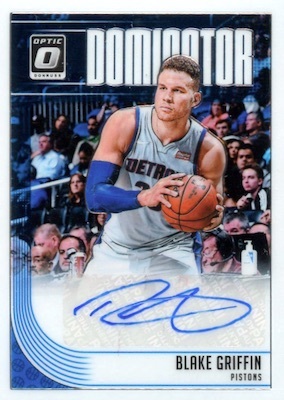 View available 2018-19 Optic NBA autographs on eBay. PARALLEL CARDS: Holo, Purple, Blue #/25, Pink #/25, Gold #/10, Green #/5, Black 1/1, Checkerboard 1/1, Gold Vinyl 1/1. 94 cards. Serial numbered #/10. PARALLEL CARDS: Gold #/10, Gold Vinyl 1/1. 30 cards. Serial numbered #/40. 30 cards. Serial numbered #/50. PARALLEL CARDS: Holo, Fast Break Holo, Red #/99, Blue #/49, Gold #/10, Green #/5, Gold Vinyl 1/1. PARALLEL CARDS: Holo, Purple, Lime Green #/149, Blue #/85, Orange #/39, Pink #/25, Gold #/10, Black 1/1. 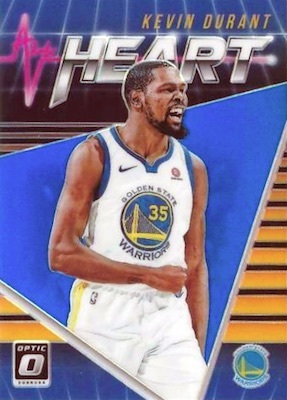 View the 2018-19 Donruss Optic Basketball checklist spreadsheet. Here are the top deals on FOTL boxes currently listed on eBay. Mass produced and low odds of hitting anyone big from the sigs, but at least it’s reasonably priced. 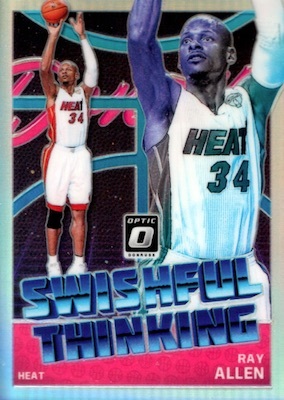 10 Years from now the Optic will be as valuable, if not more valuable then Prizm. On card autos should say more than some Prizm sticker autos. Got the ff autos: Trevon Bluiett, Jevon Carter, Junior Bridgeman, Dragan Bender, Bruce Brown and Robert Williams. Collation: terrible. In all six boxes, didn’t even get a single Luka RC. (Panini, please print more Luka as this will increase box buying more from collectors all around the world). All you got are disappointed customers who just want a base RC Luka. Autos: terrible hits. 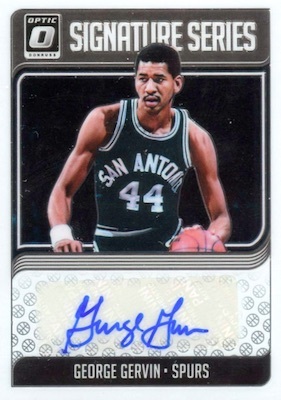 Perhaps Panini should sit a hot pack of 4 autos (even if they are bench warmers). Value: for $100 and one hit with poor collation. This is a bad product. Bought 3 FOTL boxes, 1st box had no Auto and no Purple Star #/13 FOTL Card, 2nd box had Wagner Purple Star #/13 and Luka Doncic Rated Rookie On-Card Auto, 3rd Box Musa Purple Star #/13 and Huerter Rated Rookie Auto Redemption. No, Panini, getting a Doncic Auto does NOT make up for a FOTL box without the Auto and Purple Star. And LEARN how to cut the cards so centering is the one thing you don’t have to worry about when grading!!!!! Centering should NOT be 8.5. The Doncic auto graded a 9.0 because of Panini’s cut being so far off…corners 9.5, surface 9.5, Edges 10….it would have been great Card if only the cut was centered correctly!!! I’ve opened 2 boxes soo far, happy with them. Got a Knox auto Redemption in one and a good amount of rated rookies plus the smattering of color. Box 2 gave me a Grayson Allen on card auto, and another smmmmattering of color, and more rookies. The design is pretty nice, and the cards I opened would do well for grading if that’s your main concern. For those complaining that they can’t get LuLus in every box…go back to the 80’s, or just buy one! This product is a great option that takes a nice product and makes it even better. 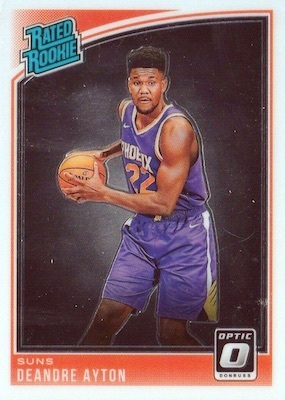 It is great to see reasonable options like Donruss Basketball then upgraded to Optic. Chris, I’ve ripped a case and haven’t sniffed a monster card like the Doncic that you hit. To hear you complain makes me happy that you didn’t get the “pristine” version of the card….what’s the point if they are all 10/10. I hope someone who will appreciate the card hits it and enjoys it. You can keep complaining about hitting a monster but the monster has an ugly face! Seems appropriate for you!! Bought three boxes, first one had 20 rated rookies most aren’t in the NBA. Below average blue auto. Next two boxes 10 rated rookies a sticker auto and then a redemption card that will take a year to fill. In fact I’m done with PANINI. Just seem to be wasting my hard earned money and time with PANINI just like I still am waiting on redemptions from over a 5 YEARS AGO, i’ve tried to contact them via phone and email nothing. Agree with most people here who said this product is a waste of money and terrible! Good – the only thing I like from this product are the numbered cards. The chrome finish was nice but would it have been better if they include that in donruss instead and make OPTIC a totally different product line. Bad- $100 for a box of one auto and tons of junk nobody wants. That $100 is better suited for a crown royale or even certified. 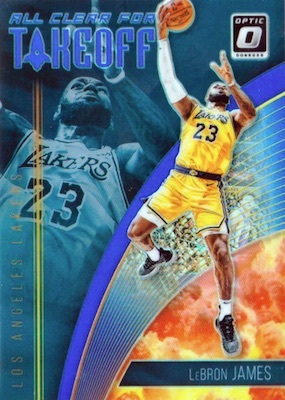 Ugly- this product is discouraging new collectors into the hobby and for an 80s guy, 90s was great with Upper Deck, Fleer, Sky Box and Topps providing great value for their money. Even if there are less autos in place but every box is worth opening it. Hope they improve this product to entice more buyers. I agree with most of the reviews here except putting more Luka’s in the box. I feel like Topps and Panini made this mistake with Ohtani in order to sell more boxes but what happens is you saturate the market and getting these harder to find cards doesn’t feel special or hard anymore. I still think $100 for one auto is awful but adding Luka’s to every and all box’s is not the right move. The Ohtani factor…his value has dropped because everyone has one now. Oh come on people the base set look was amazing! Compared to last year! !2018-19 PANINI OPTIC DONRUSS BASKETBALL FACTORY SEALED HOBBY BOX!